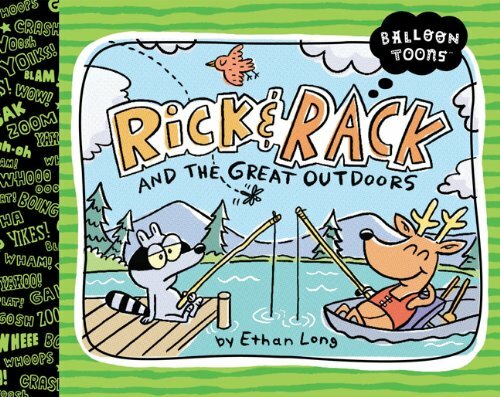 Rick and Rack are a raccoon and a deer, respectively, and in this slight graphic novel they go on three different outdoorsy adventures, including fishing, tracking, and paddling around the lake in a canoe. There is really no through-line to the three anecdotes, and this book ultimately comes off as an extremely abbreviated comics collection. Perhaps in a larger collection of comics, a story and relationship between the pair could begin to emerge, but as it stands, this book is an unexciting entry into the field of graphic novel as easy reader. Long’s art is as charming as ever, but as characters, Rick and Rack are just as bland as their names. Hand it to Ethan Long fans only if they are tired of Manana Iguana. Otherwise, there’s better stuff out there.